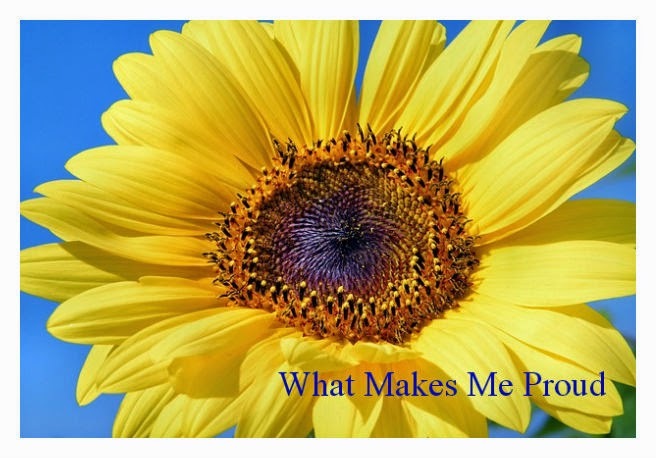 The Book Of Me: Prompt 31 --What Makes You Proud? This week's prompt is - What makes you proud? Myself. That's right myself. I am putting myself first on this list because in the not so recent past I was not able to do this. If for nothing else, I am proud of doing that --at last! I am proud that I have been able to make amazing changes in my life over the last year and a half that have improved my mood, my relationships, my communication skills, my energy level, and have returned a sense of optimism to my heart and to my mind. I have stopped drinking. Yes. I used to medicate myself with alcohol at times to somehow ease my anxieties, and give myself a false sense of confidence that what I was doing was alright. It wasn't. I know that now and own it proudly. I know now that there are times in our lives when we slip, fall, almost drown in our own man-made landscapes of despair. We have to recognize in those times that it is okay to reach out for help. In fact it is a necessity. People are not islands. We need each other. We are all here to help each other. Sometimes you are the helper but one must recognize those times when you are the one in need of help. One of the greatest lessons I have learned on this journey of sobriety is the importance of surrendering. Open your heart, open your mind and let the spirit of God or whatever faith you believe in lift you and help guide you to your best self. I am no where near done but I feel lighter and that I am taking the right steps to bring me closer to that place. I am extremely proud of my spouse, my life partner, my love...my dear Tom. He is a self-made man. If he puts his mind toward doing something, he can accomplish anything. He's made changes as well so he now lives a more balanced life. Our ability to communicate with one another is so much better than it was. I enjoy watching him grow every day from the experience of being a father to our two kids. I am proud to call him my husband and companion on this journey called life. I think I am going to leave off with that. I am extremely proud of my children, my parents, various friends and family members so this post could literally go on for days. I feel I have said what I needed to say for now. Now on to Prompt 32! Congratulations! Having helped bring someone through sobriety, I understand many of the challenges. So glad you are proud of yourself #1, you should be! I am proud of you too!